Sky has shown off its next generation electronic programme guide, which reflects the changing nature of the UK's viewing habits. 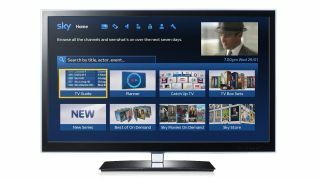 Sky's latest figures showed that on-demand viewing, both through the Sky box and connected devices using Sky Go is up, with the company's technology and apps proving to be big wins. The week of Christmas apparently saw 35 million viewing requests through connected devices, a 50 per cent rise compared to last year. Sky explains that the trend for on-demand will bring a big visual change to the electronic programme guide - describing it as the 'biggest shake up...since its introduction at the launch of digital TV in 1998. The first picture is of the EPG homepage and illustrates that on-demand is brought to the fore, with Catch Up TV, TV Box Sets, Sky+ Planner and Sky Store as well as the rather necessary TV Guide. Perhaps most importantly, search is available from the main page, reflecting the popular app that proliferates on mobile devices. "We're passionate about giving our customers their favourite content however they want to watch and will continue to make Sky's connected TV services even bigger and better during 2014, including an enhanced EPG that makes it even easier to find on demand content," explained Sky's director of TV products Luke Bradley-Jones. Obviously we do not yet know the precise launch date for the new EPG, but the suggestion is that it will be in Spring, so the wait should not be too long.